If the Tour de France isn’t exciting enough for you this year, maybe you can find some excitement in participating yourself, at your very own dinner table. The Tour de France game promises a fun experience where you’ll have to lead your team to victory after cycling the different stages. The game definitely looks appealing, as does the concept. It’s hard to beat the thrill of the real Tour de France of course, let’s see if the game comes close. The game board shows a top view of the flat stage in Cagnes sur Mer on one side, while the other side shows a top view of the mountain stage of the Col d’Aubisque. Both sides are quite detailed. You’ll see houses, a harbor, a beach with sunbathing folks, but also fans at the side of the road, tour busses, helicopters and police. The cyclists in each team look the same, except for their jersey color, which is nothing to be fussy about, but something to mention nonetheless. Just like in the real Tour, the goal of Le Tour de France is to get the best results with your team over several stages in the Tour, in order to book the fastest time and be first in the final classification. The idea is simple, but there are a few things to keep in mind. Each player has a team of three cyclists to run. 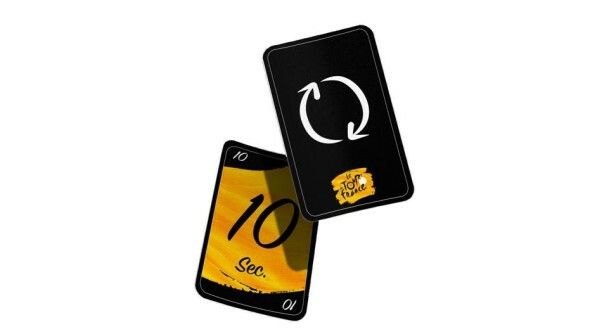 At the beginning of the game, you get five second cards per cyclist, so fifteen in total, with which you can move your cyclists on the board. The number of seconds will decide the amount of boxes you can move forward. The first cyclist catches the wind, thus giving the cyclist behind him a slight advantage, which means that whoever cycles behind the first, can move one box closer if he’s one or two boxes behind. It’s a small extra, but one that is handy anyway. Some of the boxes have icons on them, which means that you can either switch three of the cards in your hands, or take a chance card. Of the former, there are a bit too many, but it’s good nonetheless to have the opportunity to switch cards every now and then. The latter adds a bit of fun, as you never know what you’ll get. While the stories on these cards are fun enough, the outcome is usually the same: go a few boxes further, go a few boxes back, or skip a turn. In the end, this caused us to not even read the stories anymore, despite them being quite original at times. When cycling, it’s always possible that two cyclists crash into each other. While you’re obviously not supposed to do this on purpose, sometimes it’s just inevitable. All cyclists passing the point of the crash in the same round will also be involved, so then all of them have to skip a turn before they can cycle on. This can be quite frustrating, as an early crash can already decide part of the outcome. One way to get extra points and a better time, is to do intermediate sprints. This means that the first to pass the sprint sign on the board will receive the indicated amount of points and seconds. Another way to influence your time is, when you finish, to get as far behind the finish line as possible in one go. The amount of boxes behind the finish line will be deducted from your final score. The first cyclist to finish will thus have a score of 95 seconds (the amount of boxes on the board before the finish line), with the amount of boxes behind the finish line deducted, as well as the seconds he may have won with the intermediate sprints. Every cyclist that finishes during the same round will have a score that is built up the same way. Cyclists who finish in the next round will have to add ten seconds to their finish time, while cyclists who finish the round after that will have to add twenty seconds to their time and so on. This means that it’s best to not lose track of the last cyclist of your team, as it’s the whole team’s result that counts, and not only that of the best cyclist. After each stage, it will be decided who can wear the yellow jersey, and at the end of all stages (the number of stages you can choose yourself), a final winner will be revealed. The score isn’t that simple to keep track of using the notebook that comes with the game, partly because the notebook isn’t that clear to work with, but also just because there is a lot to take notice of. The developers of the game must have known that beforehand, as you can go to their website and keep track of the scoreboard online. This way you won’t have to do much of the counting, the website will just easily give you each player’s score. There are two stages that you can play, as mentioned before. The flat stage, Cagnes sur Mer, allows you to play just a standard game, but the mountain stage, Col d’Aubisque, makes for an extra feature to take into consideration. When going uphill, the second cards you play will only allow you to progress half of the amount of boxes indicated on the cards, while downhill, you will be able to go faster when cycling behind the first one, because he catches the wind for you. Other than that, this stage plays exactly the same as the flat stage, but it’s fun that there is something extra to it. Even though the game promotes itself as being strategic, we found luck to play quite a big part in deciding who won the game. At the beginning of the game, all cyclists are still very close together, making the chance of a crash quite big. To avoid it, low cards can come in handy, but if you’re unlucky, you just crash with a bunch of other cyclists, forcing you all to skip a turn, while the happy first immediately gets an advantage that is almost impossible to overcome. When playing with two players, this problem wasn’t that apparent, but with three or more players, this is almost bound to happen. Another reason for luck to be so important, is the fact that there are plenty of opportunities to get rid of bad cards in your hands, so once the cyclists are a bit scattered over the trail, it’s a piece of cake to just have only good cards that will get your cyclists going quite fast. Every now and then, a bit of strategic playing might be a good idea, but overall, we definitely found the game to be relying more on luck, which sadly makes it less interesting that we hoped it would be. 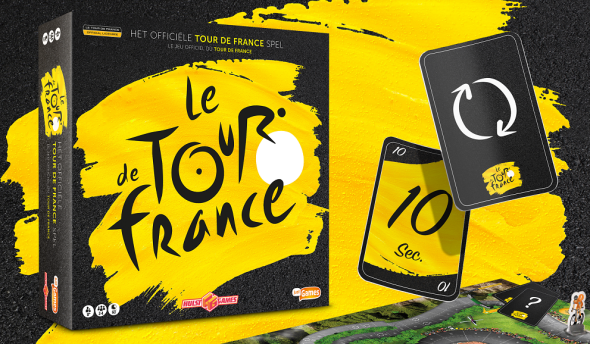 Le Tour de France is a game that looks very appealing, and also the concept isn’t bad. Sadly, it relies more on luck than on strategy, which makes it lose part of its charm. Still it’s fun to play a stage or two, but it would have been much nicer if there was more strategy to it. Overall, we didn’t hate it, but we didn’t love it either.